So you’re off to the city for FNCE? Be prepared for an eclectic food scene. Boston is no longer “bean town”; it has moved from its historic culinary past into a new age of hip dining. As you prepare for the American Dietetic Association’s Food & Nutrition Conference & Expo in Boston this fall, you may be lamenting that your dining experience will be about as fresh and exciting as Boston “beans and cod.” But get ready for a surprise. Food critics have been dishing out glowing reviews of Boston’s culinary revitalization, which can be traced back to an eclectic mix of daring chefs, local foods, and an influx of globe trotters who have brought a rainbow of ethnic establishments to town. Don’t forget that Boston’s food cred is legendary—the city is home to America’s oldest restaurant—and it hosts some of today’s hottest establishments. “People usually think of Boston dining as boring food, like fried seafood. 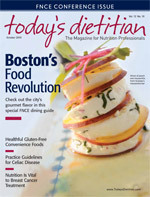 But Boston has a vibrant eating scene; it’s come along to be a very exciting place with a lot of local, sustainable foods from local farms and great chefs,” says Sara Baer-Sinnott, president of Oldways, the Boston-based nonprofit organization that promotes healthful eating based on traditional diet patterns. “There is a great variety of restaurants in Boston, with choices at all levels of dining; it’s as good as it gets,” says Ana Sortun, chef and owner of the acclaimed Boston-area restaurant Oleana. It’s only fitting that one of the nation’s most historic towns would possess an intriguing food history. At the beginning of the 18th century, Boston didn’t have a central marketplace, so vendors pushed carts through town selling local fare such as seafood, wild game, fowl, apples, nuts, berries, and onions. Cooking traditions were based on those of English and Irish immigrants, featuring plenty of stews, roasts, preserved meats, biscuits, and puddings. North American regional foods such as corn, squash, beans, and potatoes were introduced to the local cuisine. Faneuil Hall, built in 1742, served as a marketplace for fresh goods as well as an area for public congregation. The region became important for trading, farming, and fishing. By the 19th century, traditional Bostonian dishes such as baked beans slow-cooked with molasses, deep-fried batter-dipped clams, and creamy clam chowder (which got its start as a working-class, one-pot meal for New England fishermen) began to appear on dinner tables. But over the decades, Boston’s food culture took a hit as Faneuil Hall fell into disrepair and farms gave way to industrialization. Fortunately, the past few decades have brought about a culinary revolution for Boston’s food scene. If you’re a food and history buff, there’s no better way to spend an evening than visiting one of Boston’s historic restaurants. Union Oyster House (41 Union Street, 617-227-2750, www.unionoysterhouse.com), considered America’s oldest restaurant thanks to its 184-year history, was a favorite of Daniel Webster and John F. Kennedy. Though it’s famous for its oysters, you can also sample other New England seafood specialties. With a 140-year history, Locke-Ober (3 Winter Place, 617-542-1340, www.lockeober.com) was frequented by the likes of the Kennedys and Abraham Lincoln. A monument to art and history, this restaurant is presided over by local culinary legend Lydia Shire and serves classics with a modern twist, such as flash-grilled Caesar salad with deviled egg and lobster curry with fava beans. A wave of celebrated chefs, including Todd English, Ming Tsai, and Peter Davis, honed their skills in Boston. Janice Newell Bissex, MS, RD, of Boston-based MealMakeoverMoms.com, says, “Many of Boston’s famous chefs sprang up from the same well—they worked together at Michela’s and then branched off on their own.” In 1985, Michela Larson opened the now-closed Michela’s in the Carter Ink Building, with Todd English as chef. Todd English, one of the most decorated and well-known chefs in the world, has basically become a brand, considering the success of his books, television appearances, and restaurants, including Olives (10 City Square, Charlestown, 617-242-1999, www.toddenglish.com) and Figs (42 Charles Street, 617-742-3447). Celebrity chef Ming Tsai opened the Blue Ginger (583 Washington Street, Wellesley, 781-283-5790, www.ming.com) more than 10 years ago to impressive accolades, including a James Beard award for 2002 Best Chef Northeast. Since then, Tsai has kicked off a successful television show called Simply Ming as well as a meal line launched in Target stores nationwide in 2000. Honored by the James Beard Foundation as one of the best hotel chefs in America, Peter Davis created a beloved “farm-to-table” blend of traditional New England cooking with contemporary elegance at Henrietta's Table (One Bennett Street, Cambridge, 617-661-5005, www.henriettastable.com), located in the Charles Hotel. Sortun, chef/owner of Oleana (134 Hampshire Street, Cambridge, 617-661-0505, www.oleanarestaurant.com), is one of the triumphant ladies of the Boston food world, thanks to her rustic yet inventive Eastern Mediterranean cuisine. It’s no wonder she won the James Beard award for 2005 Best Chef Northeast and a coveted spot on Bravo’s Top Chef Masters. With an illustrious career working in the best restaurants in Boston, Jody Adams opened Rialto (One Bennett Street, the Charles Hotel, Cambridge, 617-661-5050, www.rialto-restaurant.com), the landmark restaurant serving regional Italian cuisine interpreted with New England ingredients, in 1994. Three years later, Adams received the James Beard Foundation award for the Best Chef Northeast for her farm-fresh, inspired food and this year shared the limelight with Sortun on Top Chef Masters. Michael Schlow is another chef making his mark on Boston dining, according to Bissex. In 2000, he won the James Beard award for Best Chef Northeast for his first restaurant, Radius (8 High Street, 617-426-1234, www.radiusrestaurant.com), which serves modern American cuisine utilizing classical French techniques. Soon after, he opened Via Matta (79 Park Plaza, 617-422-0008, www.viamattarestaurant.com), dishing up authentic Italian fare, as well as Alta Strada, a regional Italian restaurant located in Wellesley, Mass (92 Central Street, 781-237-6100, www.altastradarestaurant.com). No discussion on the impact Boston’s chefs have made on local cuisine would be complete without mention of Barbara Lynch. With five restaurants—No. 9 Park (9 Park Street, 617-742-9991, www.no9park.com), B&G Oysters (550 Tremont Street, 617-423-0550, www.bandgoysters.com), The Butcher Shop (552 Tremont Street, 617-423-4800, www.thebutchershopboston.com), Sportello (348 Congress Street, 617-737-1234, www.sportelloboston.com), and Menton (354 Congress Street, 617-737-0099, www.mentonboston.com)—one bar (Drink, 348 Congress Street, 617-695-1806, www.drinkfortpoint.com), a demonstration kitchen, and a catering company in her empire, she has garnered a string of awards, including a James Beard Best Chef Northeast award in 2003. Lynch combines an equal measure of rustic Italian and French flavors, the appeal of local New England bounty, and chic elegance in her trademark touch that keeps her restaurants on the “Best of Boston” lists. You can also credit Boston’s revolutionary chefs for bringing an appreciation of local, sustainable, organic, and artisanal foods to the city. Under their loving eye, boutique farms, farmers’ markets, and community-supported agriculture have flourished, providing chefs with the ingredients to elevate dining in the city, with the side benefit of promoting these foods to home cooks. “We are seeing more of an emphasis on local, sustainable food in Boston. People are becoming interested in where their food comes from—even where the cheese and eggs come from,” notes Bissex. Chefs are forging close relationships with farmers to further connect the table to the farm. You can’t get much closer than the relationship Oleana shares with Siena Farms, a 50-acre farm nestled in the fertile Sudbury River valley about 25 miles west of Boston. The farmer, Chris Kurth, is married to Oleana’s chef/owner Sortun, and the farm is named after their daughter, Siena. The produce is grown using traditionally sustainable farming practices of modern organic agriculture and is free of chemical herbicides, pesticides, and synthetic fertilizers. “Food politics play a very important role now in attracting customers, and all the top restaurants promise local ingredients and most offer sustainable choices, too,” says Orcutt, who points to Hamersley’s Bistro (553 Tremont Street, 617-423-2700, www.hamersleysbistro.com) as a perfect example of a restaurant dedicated to local food. For more than 20 years, Hamersley has used the finest of local New England ingredients to create hearty French-American food, such as the summer entrée grilled poussin with summer vegetable salad and arugula panzanella salad with sherry vinegar glaze. Frank McClelland, celebrated chef of L’Espalier (774 Boylston Street, 617-262-3023, www.lespalier.com), which serves sophisticated New England-French cuisine with an emphasis on artisanal and New England ingredients, truly understands the origins of food. McClelland’s team cultivates the land of the restaurant’s 14-acre organic farm, Apple Street Farm in Essex, which provides fresh herbs, heirloom fruits, vegetables, eggs, and livestock. He closes the farm-to-table gap by feeding the livestock produce and grains from his establishment’s overages. To appreciate the New England bounty, make time to visit one of Boston’s farmers’ markets (www.massfarmersmarkets.org), which are usually open through Thanksgiving. Boston City Hall Plaza (Cambridge Street, Monday and Wednesday from 11 AM to 6 PM and closing at 5 PM after daylight saving time ends) and Copley Square (St. James Avenue, Dartmouth Street and Boylston Street between the Boston Public Library, the Copley Fairmont Hotel, and the Trinity Church; Tuesdays and Fridays from 11 AM to 6 PM and closing at 5 PM after daylight saving time ends) host popular city farmers’ markets. With its variety of ethnic eateries and outdoor cafés, Faneuil Hall Marketplace (Congress and North streets, Monday through Saturday from 10 AM to 9 PM and Sunday from noon to 6 PM, www.faneuilhallmarketplace.com) is another popular way to enjoy the food spirit of Boston. The adjacent Haymarket, a longstanding open-air tradition in Boston, sells locally sourced produce and other goods at rock-bottom prices, and Quincy Market’s food court offers vibrant eating experiences. One thing has held true for Boston over the years: Seafood is big, thanks to the city’s location at the Boston Harbor and Charles River. According to MC Slim, local shellfish include hardshell clams (named according to size: littleneck, cherrystone, countneck, quahog), softshell clams (steamers), oysters (from the Canadian Maritimes and New England coasts), mussels, Maine lobster, and local crabs. Local fish include bluefish, haddock, cod, tautog, wild striped bass, golden tilefish, monkfish, periwinkles, and cockles. “My favorite places for seafood [are] Neptune Oyster [63 Salem Street, 617-742-3474, www.neptuneoyster.com], a pricey but excellent Western-style seafood place and a rare non-Italian restaurant in the North End; and the Hong Kong-style, live-tank seafood places in Chinatown, like Peach Farm [4 Tyler Street, 617-482-1116], East Ocean City [25-29 Beach Street, 617-542-2504, www.eastoceancity.com], and Jade Garden [18-20 Tyler Street, 617-423-3288], where you select your choice from the dining room’s aquarium, from which it is netted and taken back to the kitchen,” MC Slim says. Remember: You don’t have to single out a “seafood” restaurant to enjoy Boston’s fruits of the sea; many of its finest restaurants and ethnic eateries highlight a variety of local fish in flavorful and creative ways. Local foodies have a long list of restaurants to suggest for a delicious night out on the town (in addition to the ones previously mentioned). Orcutt favors La Voile (259 Newbury Street, 617-587-4200, www.lavoileboston.net) for its French-Mediterranean food, such as its signature la soupe de poissons (fish soup). She also enjoys Sibling Rivalry (525 Tremont Street, 617-338-5338, www.siblingrivalryboston.com), run by two chef brothers who create a “dueling” menu based on their interpretations of seasonal ingredients. Expect to find classical food with a generous splash of modern American style at Sibling Rivalry, such as can be seen in the entrée crispy pressed duck with whipped celery puree, cipollini onions, and sour cherries. And local power chef Larson serves up inspired Italian dishes such as monkfish and shrimp sausage with mustard mascarpone cannellini at Rocca (500 Harrison Avenue, 617-451-5151, www.roccaboston.com). Bissex adds Meritage (70 Rowes Wharf, 617-439-3995, www.meritagetherestaurant.com) in the Boston Harbor Hotel to her list of amazing dining experiences. With its beautiful setting overlooking the Boston Harbor, Chef Daniel Bruce calls on his 21 years of experience as the chef for the Boston Wine Festival to pair his fresh seasonal cuisine with a selection of wines from Meritage’s 12,000 bottle collection. The food literati have their own Boston favorites. Known for serving up “transcendental sushi,” O Ya (9 East Street, 617-654-9900, www.oyarestaurantboston.com) was called the No.1 restaurant in the country by New York Times food writer Frank Bruni. Marc Orfaly, chef of Pigalle (75 Charles Street, 617-423-4944, www.pigalleboston.com), located strategically in the theatre district, has received positive reviews from Boston Magazine and Food and Wine for his luxe Parisian cuisine served in a romantic setting. MC Slim calls Erbaluce (69 Church Street, 617-426-6969, www.erbaluce-boston.com) a “great chef-owned, locavore restaurant.” Located near the theatre district, Erbaluce features sophisticated northern Italian dishes, such as rack of wild boar roasted over walnut shells with wild concord grape mosto lightly fermented with fresh lavender branches, that local food critics celebrate. Throughout history, Boston has been home to waves of immigrants from all corners of the earth, resulting in a bold presence of ethnic cuisine. “Boston is really a great melting pot. You can find almost any type of food—from Ethiopian food, Indian with plenty of regional Indian cuisine choices, Greek, Lebanese/Middle Eastern, Thai/Cambodian, and even Tibetan food,” says Barbara Ruhs, MS, RD, LDN, a longtime resident of Boston and owner of Neighborhood Nutrition, a local nutrition consulting business. MC Slim suggests a great “touristy” adventure: Walk around the North End, hit some Italian markets and specialty food shops, do Italian cuisine for dinner, and hit an Italian bakery and/or caffe afterward for dessert. Bricco (241 Hanover Street, 617-248-6800, www.bricco.com) serves sophisticated Italian cuisine and Mare (135 Richmond Street, 617-723-6273, www.marenatural.com) offers organic and sustainable seafood to match its Italian coastal cuisine. If you’re in the mood for an intimate, traditional Italian dining experience, try Terramia Ristorante (98 Salem Street, 617-523-3112, www.terramiaristorante.com), one of the locals’ favorite haunts for pasta and more. And save room for dessert. You can find cannoli and other desserts in two famous competing pastry shops: Modern Pastry (257 Hanover Street, 617-523-3783, www.modernpastry.com) and Mike’s Pastry (300 Hanover Street, 617-742-3050, www.mikespastry.com). Soon after the first Chinese immigrants arrived in Boston in the 1880s, Chinatown became established as an epicenter of history and culture. Nestled between Downtown Crossing and the South End, Chinatown boasts authentic Asian culinary experiences from many regions. If you’re food adventurous, MC Slim suggests wandering around Chinatown for a “crawl,” getting a single dish at each of several restaurants. China Pearl (9 Tyler Street, 617-426-4338) is a favorite among the locals for dim sum; Chau Chow City (83 Essex Street, 617-338-8158) is a three-story “palace” serving seafood and dim sum; and Ginza (16 Hudson Street, 617-338-2261) is one of Boston’s favorite sushi spots. If you’re looking for eclectic, ethnic flavor, look no farther than Cambridge, a locale buzzing with students, tourists, ex-pats, and locals flocking to worldly eateries, bars, and cafes. “It is becoming the place to go for truly exotic flavors,” says Orcutt, who shares a couple of her favorites. The Afghan restaurant Helmand (143 First Street, Cambridge, 617-492-4646, www.helmandrestaurant.com) is famous for its flatbread made in a wood-burning oven. And Chez Henri (One Shepherd Street, Cambridge, 617-354-8980, www.chezhenri.com), a modern French bistro with a Cuban twist, has won a reputation for its mojitos. Craigie On Main (853 Main Street, Cambridge, 617-497-5511, www.craigieonmain.com), an all-around favorite, combines rustic French culinary style with fresh, natural ingredients and wonderful ambience in a setting near Harvard University. And if you want to try something really different, sample the blend of French-Appalachian cuisine with a focus on local ingredients served at Hungry Mother (233 Cardinal Medeiros Avenue, Kendall Square, Cambridge, 617-499-0090, www.hungrymothercambridge.com). The tapas (small plate) movement has not escaped Boston’s attention, according to MC Slim, who offers three spots for the best tapas in town. Local celebrity chef Ken Oringer serves Barcelona-style tapas sourced from local ingredients at Toro (1704 Washington Street, 617-536-4300, www.toro-restaurant.com). Oringer also offers Italian small plates with an eclectic wine list at his enoteca Coppa (253 Shawmut Avenue, 617-391-0902, www.coppaboston.com). With a bohemian flair, Estragon (700 Harrison Avenue, 617-266-0493, www.estragontapas.com) conjures up 1930s Madrid with its diverse menu of tapas and wines. If you need a break from fine dining, try one of the many tried-and-true casual eateries Bostonians can’t live without. Ruhs suggests starting off with the most important meal of the day: breakfast. “The thing that I love most about Boston is the brunch and breakfast scene. There are so many great spots that have incredible breakfast foods,” she explains. One such recommendation: Charlie’s Sandwich Shoppe (429 Columbus Avenue, 617-536-7669), a “Boston landmark with almost the same decor as 50 years ago. It's a real greasy spoon but a great feeling of Boston,” says Ruhs. “Neighborhood restaurants have become trendy. Chris Douglass has Tavolo Ristorante [1918 Dorchester Avenue, Dorchester, 617-822-1918, www.tavolopizza.com] and Ashmont Grill [555 Talbot Avenue, 617-825-4300, www.ashmontgrill.com] in Dorchester,” says Orcutt. The Franklin Café (278 Shawmut Avenue, 617-350-0010 and 152 Dorchester Avenue, 617-269-1003, www.franklincafe.com), known as “Boston’s neighborhood restaurant,” serves modern American cuisine such as cornmeal-crusted catfish and steak frites with local microbrews. Got a hankering for a good burger? Try Boston’s burger institution, Mr. Bartley’s Gourmet Burgers (1246 Massachusetts Avenue, Cambridge, 617-354-6559, www.mrbartley.com). With 50 years of experience flipping burgers, this retro joint offers “real” burgers under colorful monikers such as “The Yuppie Burger” (with boursin cheese and bacon) and “The Ted Kennedy” (a plump, liberal amount of burger with cheddar cheese). And if you’re looking for great pizza, try the favorite of The Office television star and Boston native John Krasinski, who calls Bill’s Pizzeria (753 Beacon Street, Newton Center, 617-964-1116, www.billspizzeria.com) “the gold standard by which I judge all other pizzas,” according to The Boston Globe. Why not spend après dinner with a brisk walk to satisfy your sweet tooth? “We have great independent ice cream shops. Bostonians gobble ice cream year-round,” says MC Slim, who shares his favorites: Christina's Homemade Ice Cream (1255 Cambridge Street, Cambridge, 617-492-7021, http://christinasicecream.com), Toscanini (899 Main Street, Cambridge, 617-491-5877, www.tosci.com), and J.P. Licks (1618 Tremont Street, One Brigham Circle, 617-566-6676, and 352 Newbury Street, 617-236-1666, www.jplicks.com). Joanne Chang, pastry chef and owner of Flour Bakery+Café (www.flourbakery.com, with three locations in Boston), is the genius behind the buttery tarts, grand cookies, and gorgeous cakes at this mouth-watering shop. And don’t forget Sortun’s Sofra Bakery and Café (One Belmont Street, Cambridge, 617-661-3161, www.sofrabakery.com), where you can nibble on Mediterranean goodies such as molasses cookies and chocolate hazelnut baklava. Local drink trends include high-craft cocktail bars working in the tradition of the pre-Prohibition golden age of cocktails, according to MC Slim. One can find fabulous bars in some of Boston’s finest restaurants, such as No. 9 Park and Clio. And the buzz around town is that the American bistro Eastern Standard Kitchen & Drinks (528 Commonwealth Avenue, 617-532-9100, www.easternstandardboston.com) is the perfect place to enjoy a retro cocktail, such as an Old-Fashioned or 1934-era Zombie. You can even find good eats at a number of Boston bars, such as Silvertone Bar & Grill (69 Bromfield Street, 617-338-7887, www.silvertonedowntown.com) and Audubon Circle Restaurant and Bar (838 Beacon Street, 617-421-1910, www.auduboncircle.us). “Gastropubs are doing casual American fare elevated with fine-dining preparation techniques and in-house craft such as pickling, dry aging, smoking, curing, and whole-animal butchering,” says MC Slim. Notable gastropubs include Russell House Tavern (14 JFK Street, Cambridge, 617-500-3055, www.russellhousecambridge.com), The Gallows (1395 Washington Street, 617-425-0200, www.thegallowsboston.com), and Garden at the Cellar (991 Massachusetts Avenue, Cambridge, 617-230-5880, www.gardenatthecellar.com). There you have it—plenty of reasons to enjoy Boston’s food revolution. The only problem is finding enough time to sample the city’s diverse, flavorful foods during your stay. — Sharon Palmer, RD, is a contributing editor at Today’s Dietitian and freelance food and nutrition writer in southern California.